Comments: Common muskrats are water-dwelling rodents. Well adapted to aquatic life, they have partially webbed feet, a vertically flattened scaly tail, and dense waterproof fur. Their cone-shaped "houses" made of damp vegetation can be 5 feet across and 4 feet high. They also construct bank burrows with underwater entries. Muskrats forage mostly in the twilight hours and at night. They are often mistaken for small beavers when swimming. Tracks show footprints with a tail drag mark. Females can bear up to three litters per year with 2-9 kits per litter. Maximum longevity in the wild is 4 years. 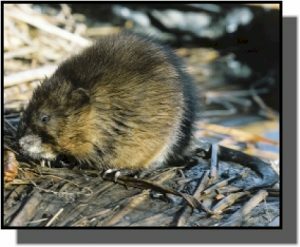 Distribution: Common muskrats live in nearly all aquatic habitats from the southern United States through Alaska. They are found throughout Kansas in marshlands, ponds, lakes and slow-moving rivers and streams. Food: Common muskrats feed on aquatic plants, fish, crayfish, snails, mussels and occasionally on eggs and young birds.